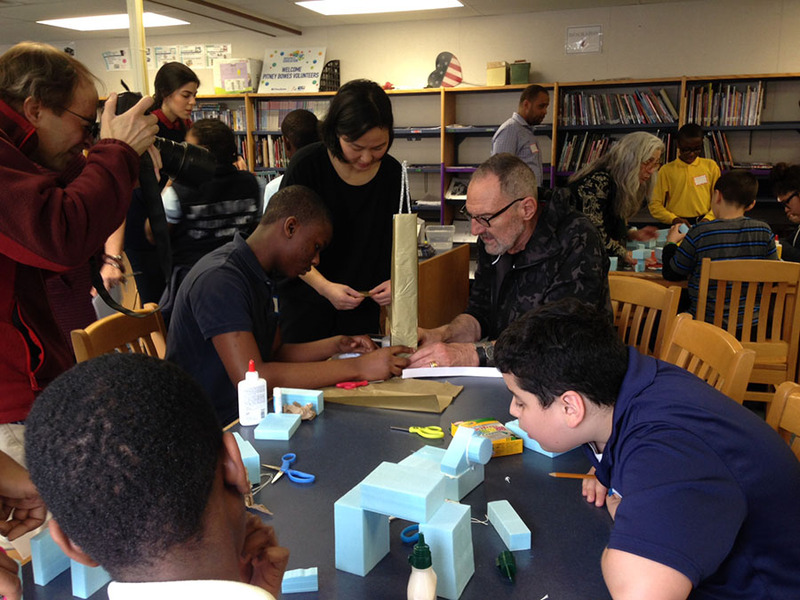 Thom Mayne, a Los Angeles-based architect, is one a Turnaround Artist working with children from Hall School in Bridgeport, CT.
BRIDGEPORT, CT - Robbin Zella, Executive Director and Curator of the Housatonic Museum of Art (HMA) and Janet Zamparo, the museum’s Curator of Education, will speak at this year’s Turnaround Arts Summer Leadership Retreat. Turnaround Arts is an initiative of the President’s Committee on the Arts and the Humanities, which uses arts education to help turn around America’s struggling schools. Zella and Zamparo will present the HMA Peer Docent program, which teaches students to observe and discover local architecture, and to be trained as docents. Held in Warrenton, Virginia, the five-day retreat provides nearly 200 participants with engaging sessions led by presenters from the nation’s leading arts and education organizations. New tools and concepts are learned and then shared with staff back home. For fifteen years, the Housatonic Museum of Art Peer Docent Program has offered supplemental arts education to seventeen underserved Bridgeport schools. The program provides students with an opportunity to use object-based inquiry and practice observing, questioning, discussing, and listening to ideas about art. Students develop visual, analytical and critical thinking skills that assist them across academic disciplines and throughout their lifetimes. For the past three years, Janet Zamparo has acted as the Curator of Education for the HMA Peer Docent Program for its management, development and implementation. 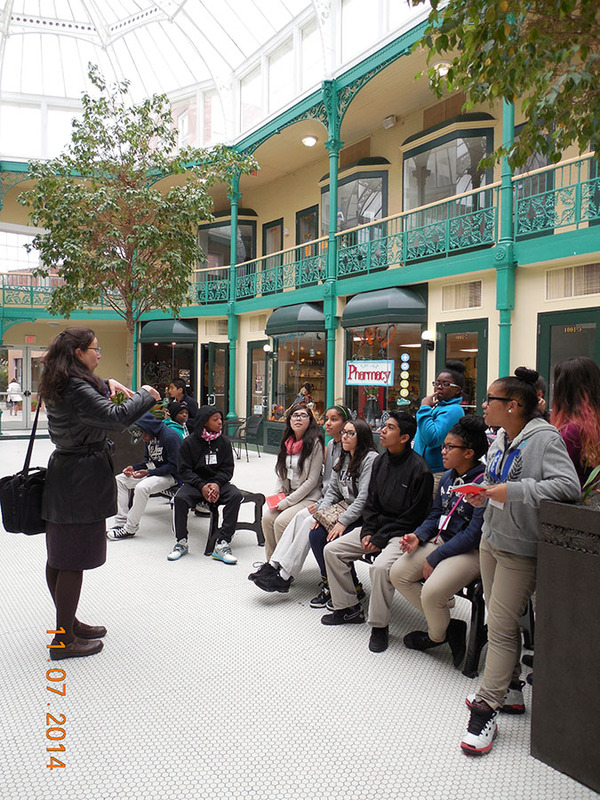 “The program teaches students about architecture, trains students to be docents and provides the opportunity for docents to guide their peers on tours. It’s a chance for kids to recognize the transformative joy, hope and imagination that the arts can bring.” said Zamparo. The President’s Committee on the Arts and the Humanities (PCAH), an advisory committee to the White House, launched the Turnaround Arts education initiative in 2011and its impact is remarkable. A 3-year program evaluation of pilot schools found broad improvements, including significant surges in reading and math scores, an increase in attendance and a decrease in suspensions. Bridgeport’s Roosevelt School was one of eight schools that participated in the pilot phase of the initiative. Today, Barnum School, Hall School, Hallen School and Jettie S. Tisdale School are also participants. Turnaround Arts: Bridgeport is helping Bridgeport Public Schools to realize its mission of readying all its students to graduate college-ready and prepared to succeed in life.